raising the barre – Page 2 – Why live ordinary? I don’t know about you, but I’ve got the biggest sweet tooth! I’ll take sweet over salty any day. I strive to eat as healthy and clean as I can to keep myself strong and energized to get through Paula’s killer thigh series, but I also know that I should treat myself in moderation. I came across a healthy dessert blogger a year or two ago who goes by Chocolate Covered Katie. I tried out a few of her recipes and I fell in love! She has so many yummy, modified sweets recipes that won’t cost you a quarter of your daily calories like so many desserts do. One of my favorites that I find myself making over and over is her oatmeal chocolate chip cookies. These cookies don’t have any butter in them, so they will have a consistency more like a soft granola bar. Bonus: They also have walnuts and coconut in them, adding in omega-3s & potassium! Healthier dessert with benefits — who says you can’t have the best of both worlds?! Preheat the oven to 350 degrees & grease a muffin pan or cookie tray. I find the muffin pan works best so the cookies don’t roll around. Since there is no butter in the recipe, they won’t melt like a normal cookie. In a mixing bowl, combine all the dry ingredients. In a separate bowl, stir together the wet ingredients. Combine the two bowls to form a dough. Chill for at least an hour in the fridge. 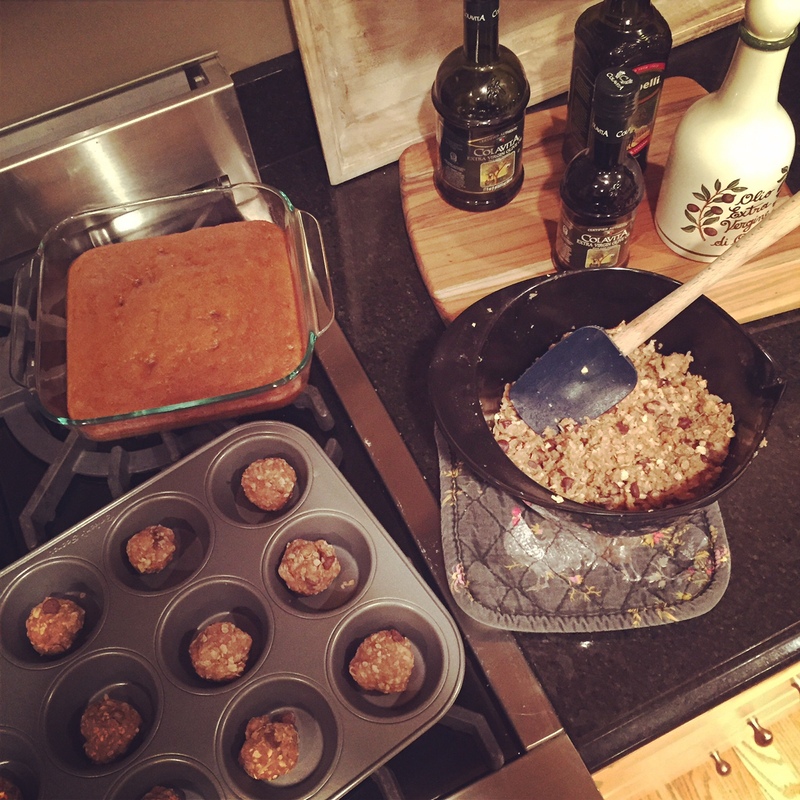 After the dough has chilled, roll the dough into cookie-sized balls and place in the muffin pan or on the cookie tray. Place in the oven and bake for 7 minutes. 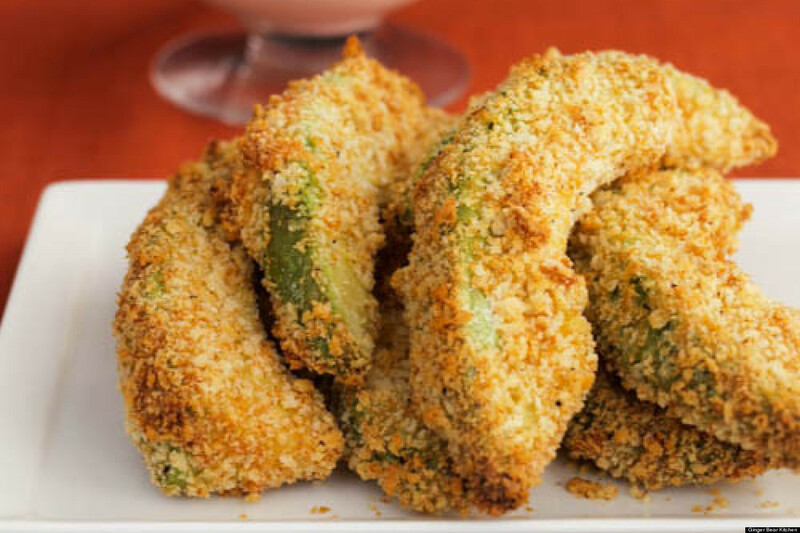 Once you remove these yummy bites from the oven, let sit in pan for about ten minutes to cool before moving to the cooling rack or plate. Dig in! I know you’ll love them as much as I do! Be sure to choose firm but ripe avocados. To determine if the fruit is ripe, hold it in the palm of your hand and very gently squeeze–the avocado should give slightly under gentle pressure. Color does not indicate ripeness and can range from light to dark green depending on the variety. To ripen hard avocados, place in a brown paper bag and store at room temperature for up to two days. Store soft fruit in the refrigerator to extend its life for two or three more days. 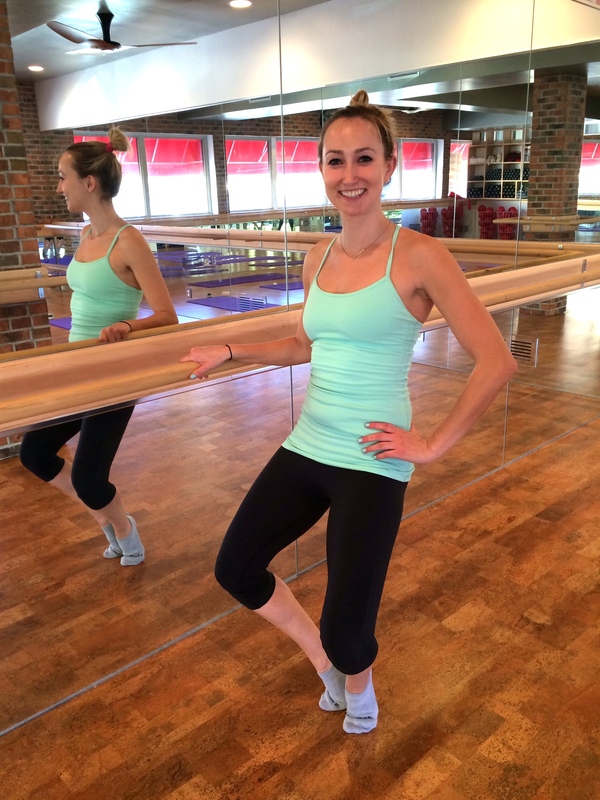 Client of the Month: Catherine R.
How long have you been coming to the barre? I usually come to the 6am classes in the warmer months, not so much in the winter unless it is the only time I can fit it in! But in regards to waking up so early, I set my alarm early enough to be able to hit the “snooze” button once or twice. Also, COFFEE. Coffee always comes first that early! Kristen and Kalli definitely make it worth the effort! What have been your favorite benefits of barre so far? Oh gosh, there have been so many benefits of taking classes at the barre! But my favorite is definitely the feeling I have once class has finished. It always feels like a great accomplishment, having worked every single muscle in my body in one hour. I feel stronger, healthier, and definitely happier! Even on days that I may lack motivation, coming to class always seems to be a positive part of my day. I also love that with each class, I am able to sink a little lower or hang on a little bit longer before taking a break as my muscles grow stronger. I just love everything about it! What challenges are you working on in classes right now? Well, my current challenge is training to become an instructor! Making the transition from student to instructor this spring will have its own set of challenges, but I am so ready to take them on! I cannot wait to share my love and passion for the barre with everyone else! To prepare chicken, combine first 4 ingredients; rub evenly over chicken. Heat oil in a large nonstick skillet over medium heat. Add chicken to pan; cook 5 minutes on each side or until done. Remove chicken from pan. To prepare vinaigrette, add 2 tablespoons shallots and garlic to pan; cook for 3 minutes or until shallots and garlic begin to brown, stirring occasionally. Stir in red wine vinegar, orange rind, juices, honey, 1/2 teaspoon fennel, black pepper, and 1/4 teaspoon salt; cook over medium-high heat until reduced to 1/2 cup (about 1 minute). Remove vinaigrette from pan, and cool completely. To prepare salad, chop chicken into bite-sized pieces. 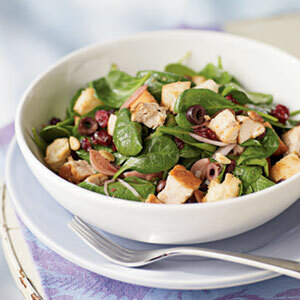 Combine chicken, spinach, and remaining ingredients in a large bowl. Add vinaigrette; toss gently to coat. Serve immediately. Will I plateau in barre? Answer (from Paula): No. I’ve heard numerous times in class that the workout seems to get harder the more classes students take, and I agree completely! A very common question is “Will this get any easier?” While the positions are challenging from the start, as you start to master the form, it’s easier to understand how to engage your muscles in a deeper way, and how to engage (or ignore!) your mind’s cues as you experience the deep burning of your muscles that signifies you getting stronger. Students thereby develop a craving for not only the physical results they see emerge from their hard work, but the mental challenge and emotional boost they get from committing and conquering a series. I tend to bulk up with weight lifting. Will barre class trim me down? Answer from Paula: Yes. The barre’s classes were built around the traditional Lotte Berk method, which has been lauded as the exercise of choice to tone and transform bodies since the 1970s! There’s a reason dancers enjoy sculpted thighs and perfect posture – they work at it, and we do, too. During the first three-to-five months that you take class however, you may feel your muscles more. This is because newly toned muscles hold additional water, and also because intra-muscular fat that has been pushed outwards. After around five months of classes, the intramuscular fat will burn away, your muscles will become more compact and elongated, and you will lose inches.So if you’re going through the initial strengthening stage, have faith! A few more months of classes will tighten your muscles, burn away excess intramuscular fat, and give you a new, trimmed down shape. And bonus, our stretching will elongate your muscles, while our focus on posture will have you walking taller throughout life. 1. Heat a large Dutch oven over medium heat. Coat pan with cooking spray. Add onion and next 4 ingredients (through garlic); cook 3 minutes. Reduce heat; cook 10 minutes or until sausage is browned and vegetables are tender, stirring to crumble sausage. Add sage and tomato paste; cook 1 minute, stirring constantly. Add wine; cook 3 minutes or until liquid is reduced by half. Add stock; bring to a boil, reduce heat, and simmer 5 minutes. 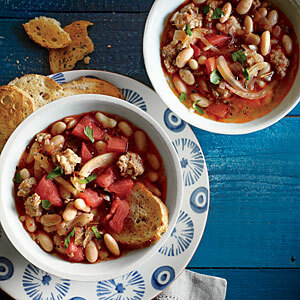 Add tomato and beans, and cook 2 minutes. Sprinkle with chopped parsley, or follow freezing instructions. TO FREEZE: Cool soup to room temperature; seal in a large zip-top plastic freezer bag. Lay bag flat in freezer; freeze up to 2 months. TO THAW: Microwave soup in bag at MEDIUM (50% power) for 4 minutes or until pliable. TO REHEAT: Pour soup into a Dutch oven. Cover and cook over medium heat until thoroughly heated (about 20 minutes). Client of the Month: Jennifer O.
I started in September 2012. I still remember my first class with Stacy – I loved it from day one! I was looking for something different in my work out routine and I had heard about barre classes. I was a dancer and loved ballet when I was younger so the barre work out sounded like something I might enjoy. I started searching and found The Barre in Wayzata. I tried a class and a month unlimited. I quickly fell in love with the studio, classes, other clients and staff. There is always such a warm and inviting atmosphere. What changes in your mind and body have you noticed most? I feel more lean and toned. I have more flexibility. I love that it never gets easier. I feel mentally and physically challenged with each class and always leave feeling great. How do you fit barre into your busy schedule? I work full time and have 3 kids so I try to fit classes in early morning or evening and on the weekends. All of the instructors are amazing and I know any time I come I’m going to have a great work out. I enjoy all times but have really started to love the 6am classes in Edina with Kristen and Kalli. They are both very motivating and it feels great to be done by 7am. It gives me energy for the rest of my day! Both studios are great. I really love being at the Wayzata studio and looking out at the beatiful lake – helps take my mind off of the pain! I don’t think that I have one favorite. I love/hate the thigh series. It is so hard but you feel so good when it’s done. I think the seat series are my favorite part of class. You really have to focus and concentrate. I love the results! Question: Is it ok/normal for my standing leg to seem to work almost as much as my working leg? YES! Every time I take class, the standing leg burn is as much of a challenge as the working seat. If you think about it – you are balancing almost all of your body’s weight on one leg for 6+ minutes…of course that will tire the leg out! We actually want that to happen as that’s our “bonus” work in our unilateral seat work – simple, weight-bearing exercise like that is absolutely amazing for building bone density as well as challenging/sculpting your muscles (that are already very tired from thigh work :). However, the challenge is to not let that standing leg burn take over your mind and have you lose focus on your working seat. Often people will say their standing leg is burning MORE…and while that’s possible, it’s only possible if you let it be that way: ie you are not thinking about squeezing the seat muscle that we want to be working. I always say seat work gets much, much harder the longer you come because as you really learn to isolate your seat muscle, you then are really burning that side while your standing leg is working, too. Initially, clients are just feeling their standing leg burn (which again, is great…but shouldn’t be the focus) and not the working seat because they haven’t quite made the mind-muscle connection yet. Remember in seat work we say to “shift your weight to the instep of your standing foot” – and if you have your hands on the barre to shift weight into the opposite hand (this is compensating for one of your legs not being on the ground) – the goal of this isn’t to make your standing leg stop burning, but rather to minimize it slightly so you are a little more comfortable and then able to keep your mind on engaging the opposite seat. Question: If I need to give my wrists a break, what modifications might be available? As many of you may know, I have had challenges with one of my wrists for a while now. Over the course of the last few months, I have learned a lot about modifying my exercise routine to ensure I do not cause further damage and still get a fantastic barre workout! First and foremost, if you are experiencing pain please see your doctor to discuss your workout routine and what you need to do to avoid injury! I saw my doctor as soon as I started experiencing pain in my wrist and was given instruction to rest and stabilize my wrist. That is why I sometimes wear a brace when I teach and take class. Since I began taking modifications in class, I have seen significant improvement. So what modifications did I try to give my wrists a break? Below are some tips that I have used and will continue to use in the future! Pushups: There are a few different options I tried with pushups. First of all, using a heavy set of weights (one weight in each hand) can help keep wrists more in line with your forearms. This may actually be more challenging since you are creating more distance between you and the mat. Another option is to use the barre for pushups starting in a similar position as the semi-pushup seat position. This has been a great option for me and still allows for taking different challenge options like pulsing one foot. Straight arm plank: One modification here is to stay in the forearm plank position instead of moving up to straight arms. Forearm planks still offer a great challenge and there is always the option to send your hands out in front of you for a deeper challenge. Another option is to use heavy weights under your hands, but I would only do this when you have both hands down and not for side planks. The side plank modification is to stay on your forearm which you will always see me do when on my right side. Tricep dips: Similar to pushups, using heavy weights in your hands is a great modification to keep wrists in line with your forearms. I began using weights for tricep dips and will probably continue to use weights. Not only has it helped my wrists, but it also helps me go even deeper in my tricep dips because I am lifted further off the ground. I have also had clients tell me that using weights has completely changed this part of class for them in a positive way. Give it a try sometime to change your routine a bit! One other option is to keep your seat on the ground with hands pressing into the mat and just focus on pressing your elbows back to flex the tricep muscle. Tabletop: This might be my favorite seat position so I am thrilled that there are so many options available to modify. First, you can use a heavy set of weights under your hands. Another option is to make fists with your hands instead of placing your hands flat on the mat. I tend to shy away from this option because I feel unstable. My favorite modification is to come down to my forearms. I find that it gives my wrists a break allowing me to really focus in on my seat and legs. The beauty of tabletop is that you do get some upper body work along with a killer seat burn, but we never want anyone to lose focus on their seat because of too much upper body distraction. Semi-pushup: If this position causes you any wrist pain, first ensure your wrists are staying in line with your forearms and are not bending. If it is still too much, modify with the standing bent knee position. You can still do the same combos but are standing up instead of leaning in to the barre. The only thing you miss out on is that added upper body bonus work! Again, these are some tips that have helped me. If you have any questions please talk with your instructor as modifications are always available. Keep in mind that modifications may not make a position easier. A modification may indeed add an extra challenge!